On Wednesday, August 16th, we're celebrating our 3rd Birthday at One Well Brewing with a night of drinks, drawing, and fun! There will be everything you need to draw like a kid again; but this time, with beer! Whether you're an amateur stick-figurer or an acclaimed artist, we want you to use your imagination, meet new people, and enjoy a delicious craft beer! As Kalamadoodle continues to grow, we search for new and impactful ways to spread creativity, build community, and do good in our local community. With these principles in mind, we're excited to use our platform to draw (puns always intended) attention and resources to causes that align with our own. 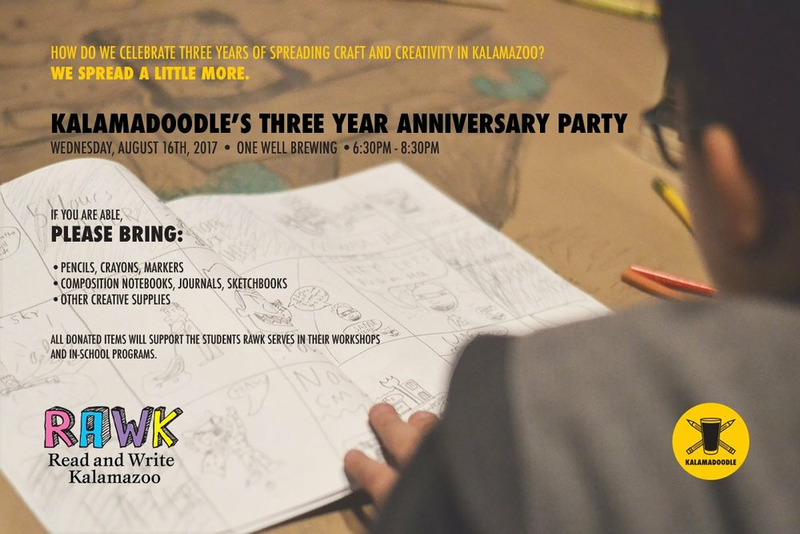 For Kalamadoodle's Three Year Anniversary at One Well Brewing please bring any art supplies you're willing and able to donate. All supplies will benefit the students of Read and Write Kalamazoo. Thank you for your thoughtful consideration and generous giving!